(Oceanside, Oregon) â€“ You'll find this monster of a state park along the Three Capes Loop, or Three Capes Tour â€“ whatever you prefer â€“ at around MP 0. It's the beginning of the Netarts Spit, and the end of the trail descending from Cape Lookout. The beaches here begin just below the cape â€“ or it ends there, depending on how you look at it. At this section of the strand, things are a bit more level, but closer to the entrance and throughout most of the length of the sand, the shoreline dips abruptly, causing the waves to come in fast and hard, but dissipate quickly. 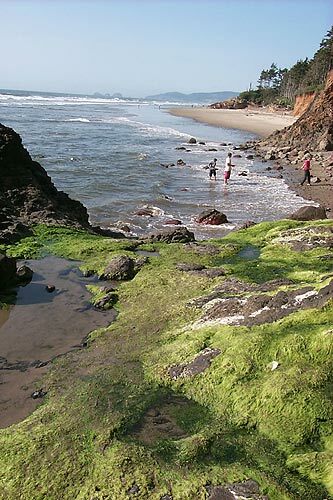 Right below the cliffs of Lookout, you’ll often see a spot of green goo, where the tide has let a host of sea stuff live and thrive. These beaches technically run on for miles, if you count the spit. 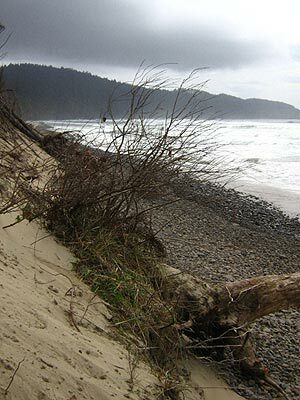 But the state park itself deadends just a mile or so from the last beach entrance near the campgrounds. A kind of secret path meanders on from the edge of the campground, wandering through marshy green areas, with loads of forest in the background. At this point, you’re going down a stretch that’s largely cut off from the beach, with a sizable hill following you. On the other side is the beach, which continues on into the Netarts Spit. There are one or two hidden sandy paths that allow you to head up this hill, making you think it’s a nice secret entrance to the beach and the sizable stones. They are not. You’ll get to the top and realize it’s a couple dozen feet drop down, with no way to climb safely. So it’s best to resign yourself to this little viewpoint and take in the sights. But it is interesting to notice that those walking along the beach towards the spit will see a sandy cliff next to them. It looks as if the entire structure may well be nothing but a dune well covered over in greenery. 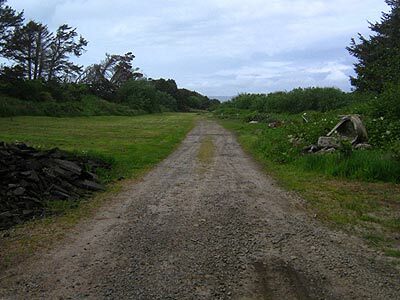 Hiking Netarts Spit is a 10-mile endeavor round trip. It’s roughly five miles from the edge of the state park to the tip of the spit. Doing this in a loop is not easy and it’s advisable to simply return along the beach path you came on, as the bay side is thick with vegetation.